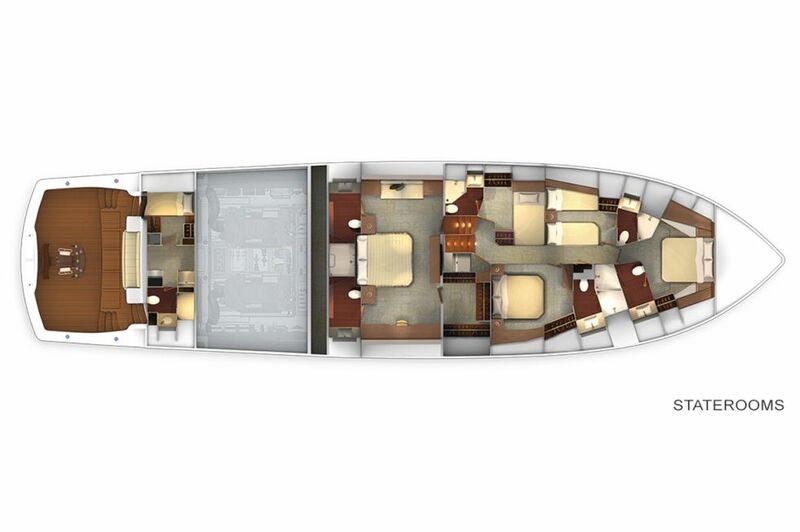 One word best describes the 92 Sky Bridge: awesome. 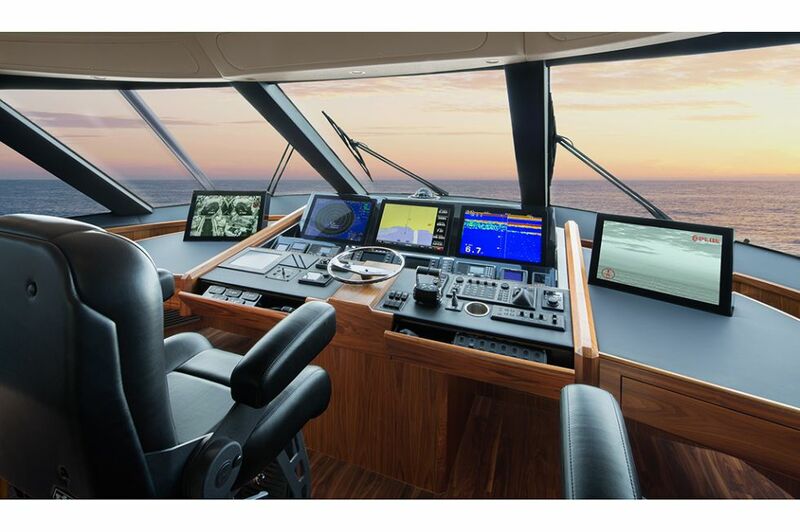 More than aesthetically stunning, our sky bridge design is also functional, combining all the visibility benefits of an elevated control station with the weather protection and comfort of a Viking enclosed bridge. 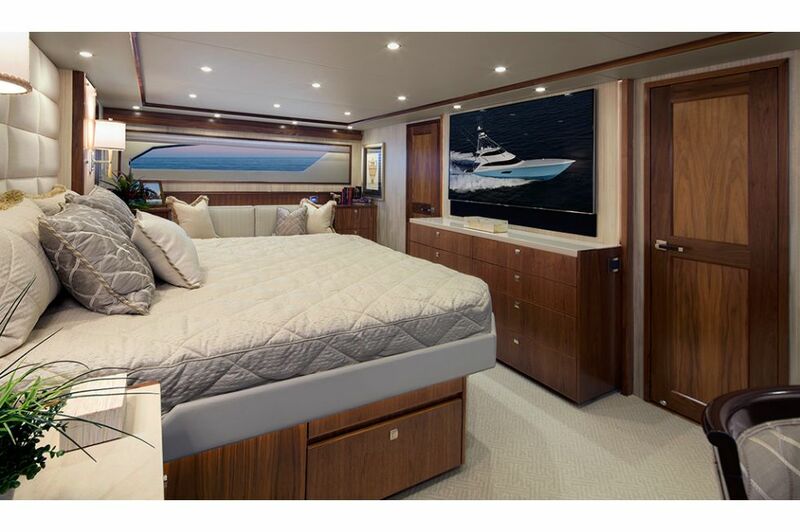 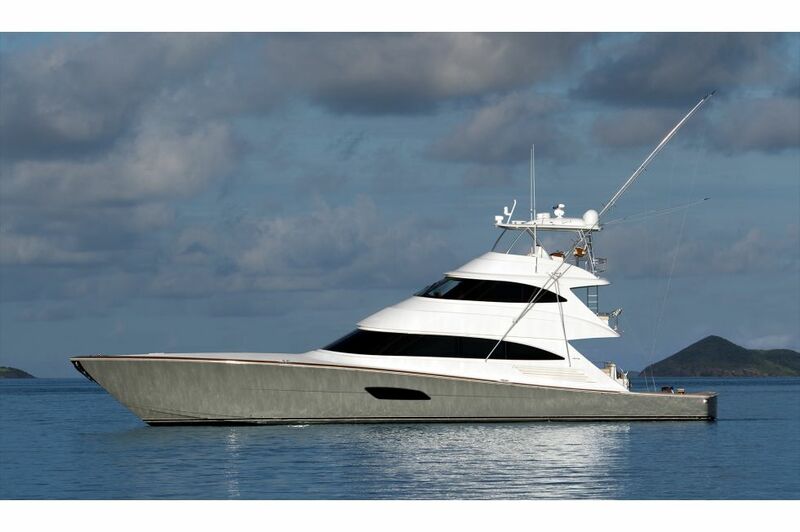 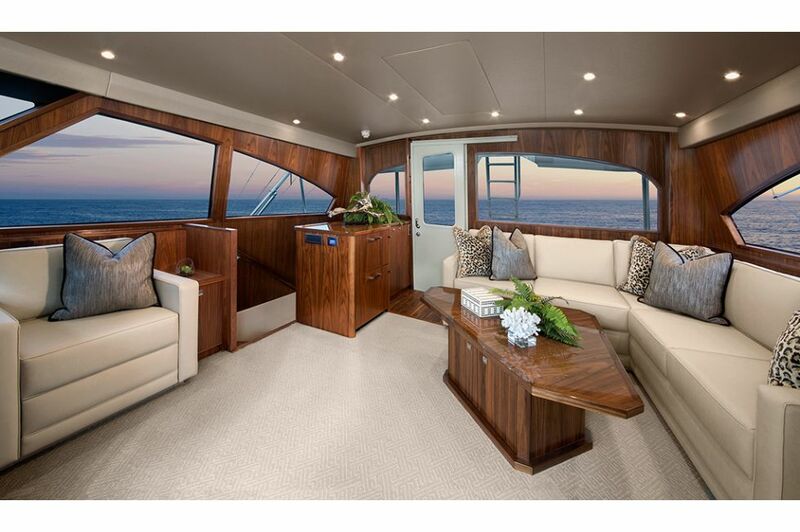 With her two-level mezzanine and 238-square-foot tournament-ready cockpit with fighting chair, the 92 thrives as a luxury cruising yacht and blue-water sportfishing convertible. 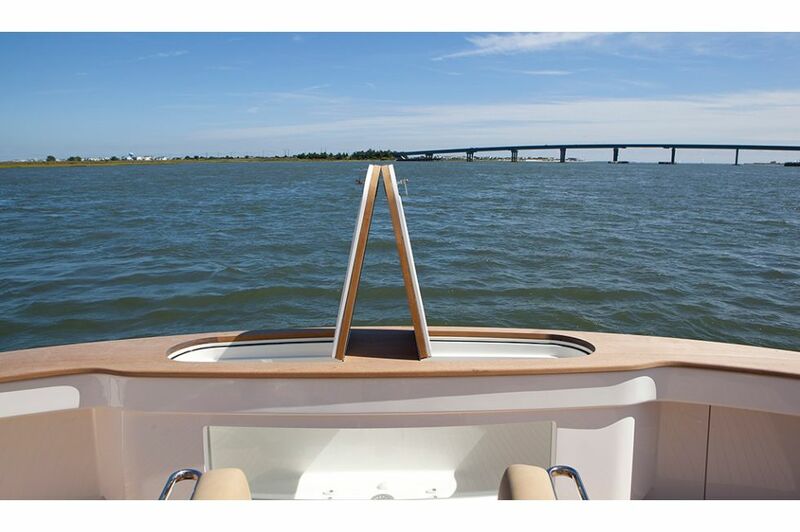 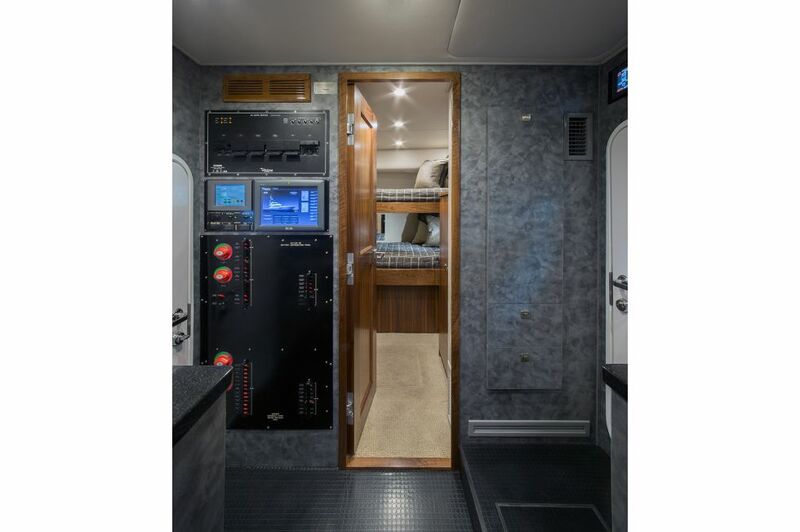 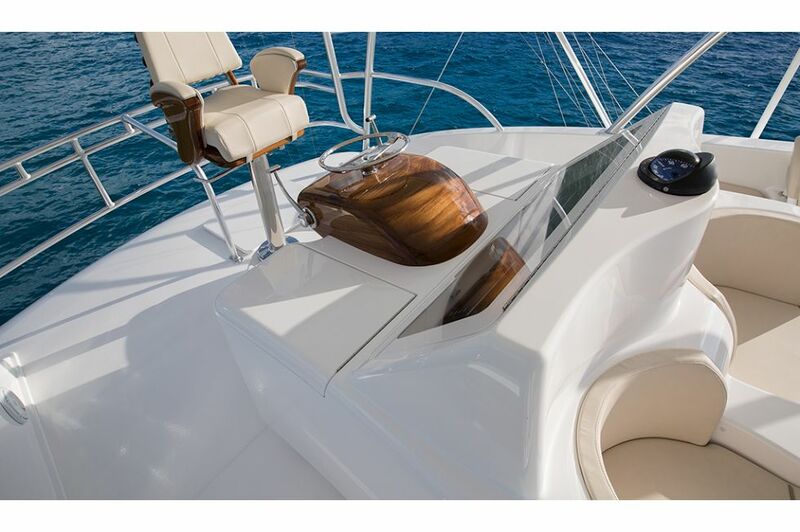 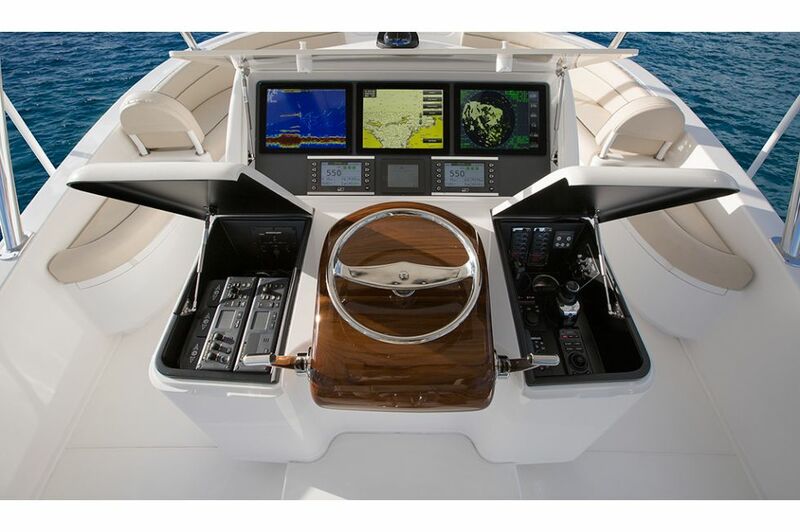 The sky bridge command station shares many of the design traits of our open flybridge convertibles, such as the walk-around center console with raised teak helm pod and recessed and protected areas for multi-function displays, engine and steering controls and electronics controllers. 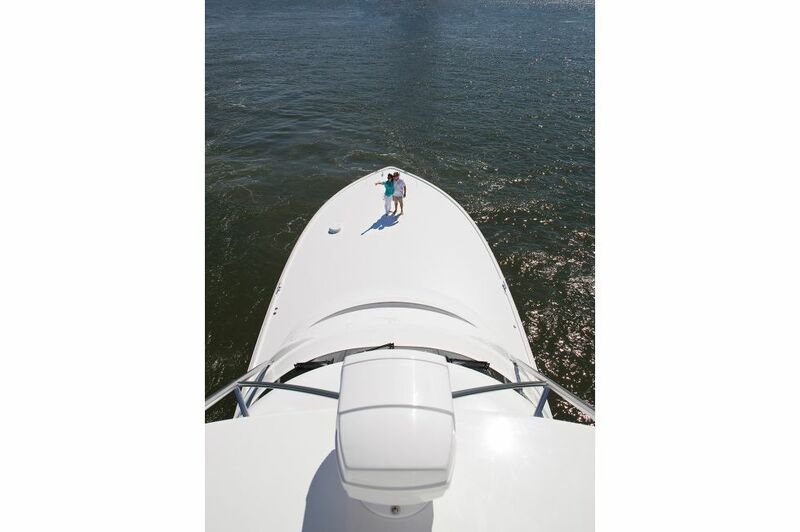 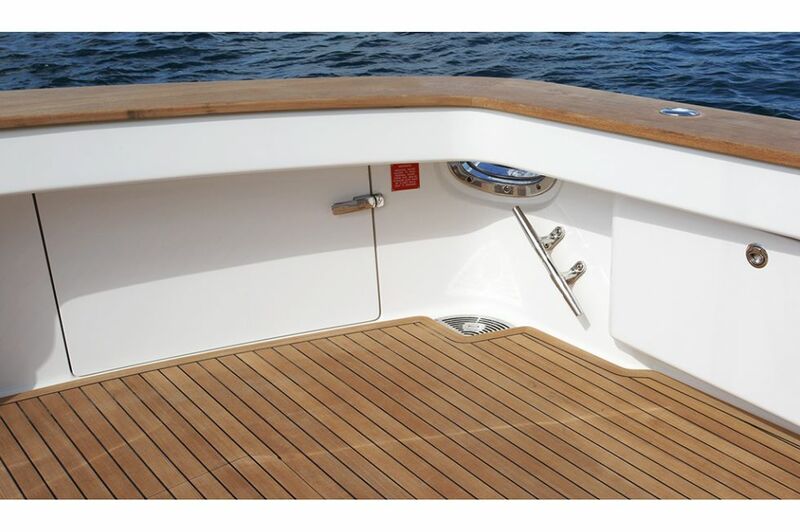 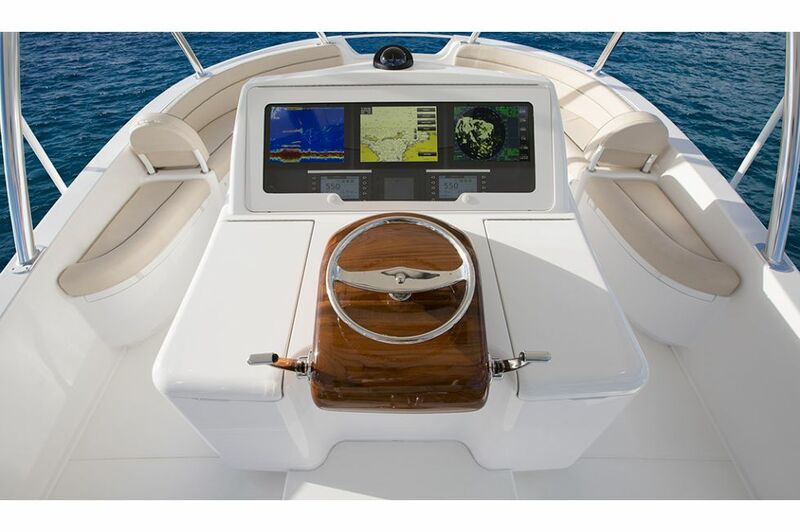 With the console's molded-in step, the captain's sightlines are enhanced further. 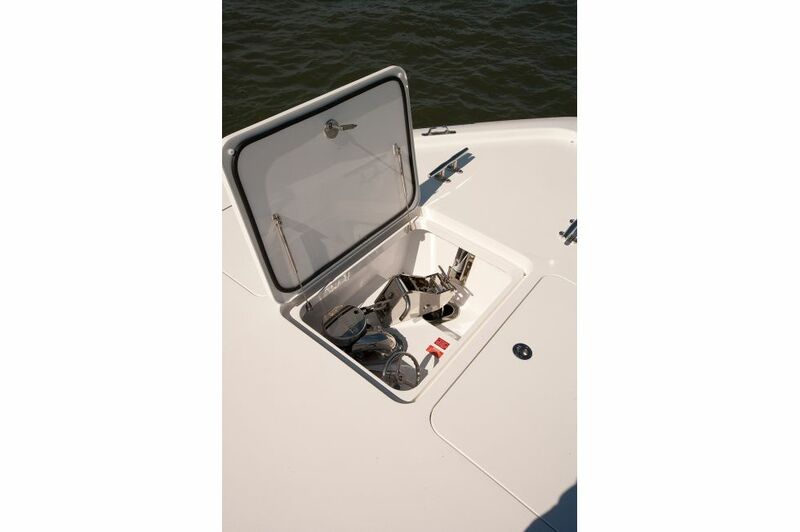 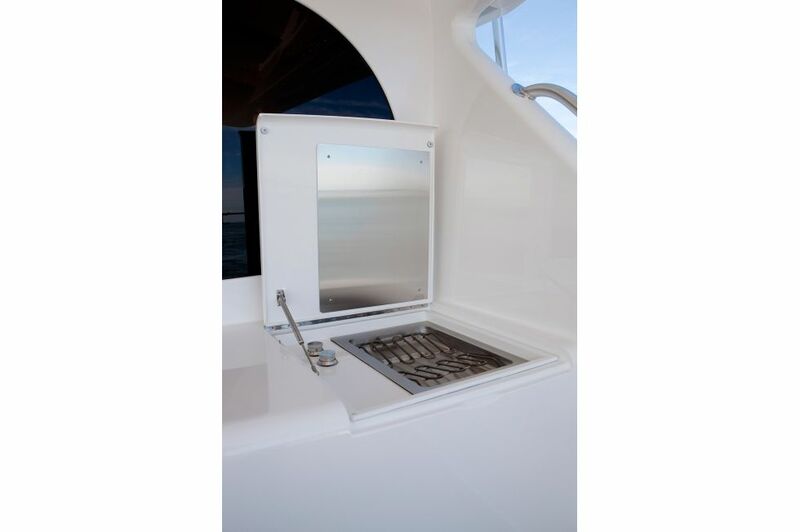 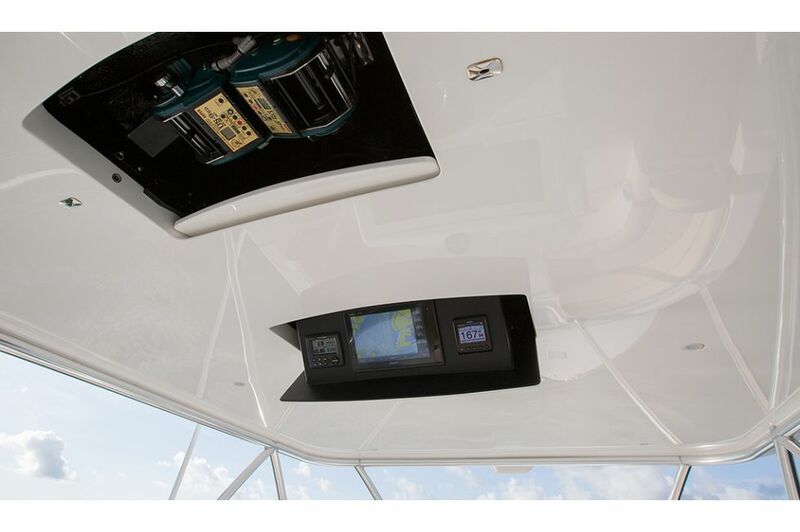 The hardtop holds an electric teaser reel and power-actuated drop-down electronics box. 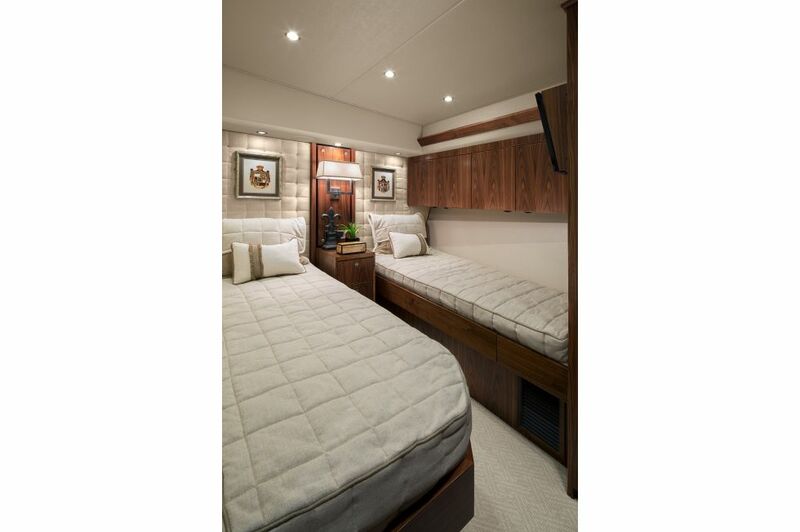 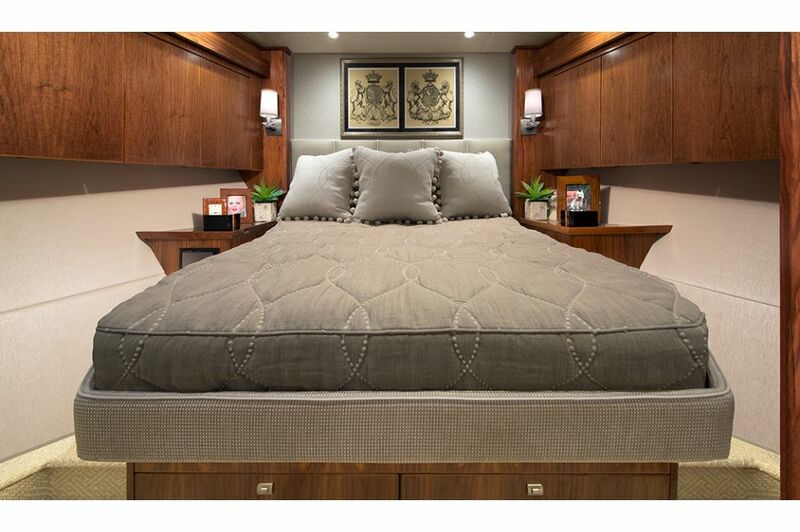 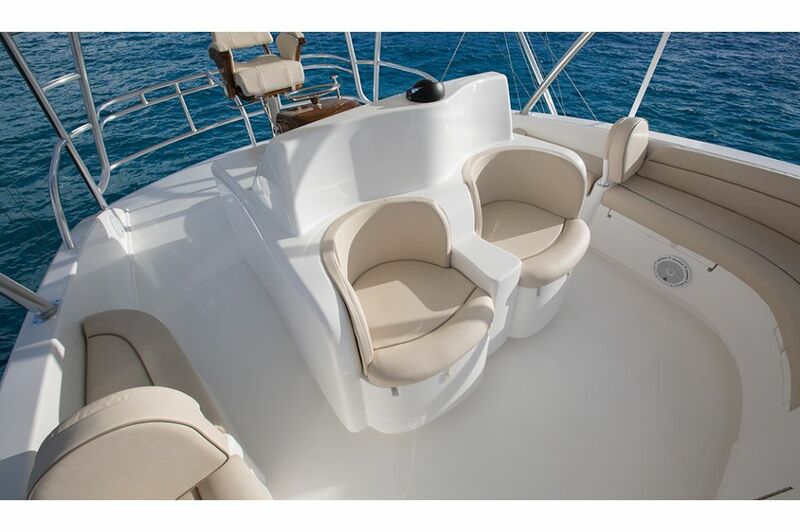 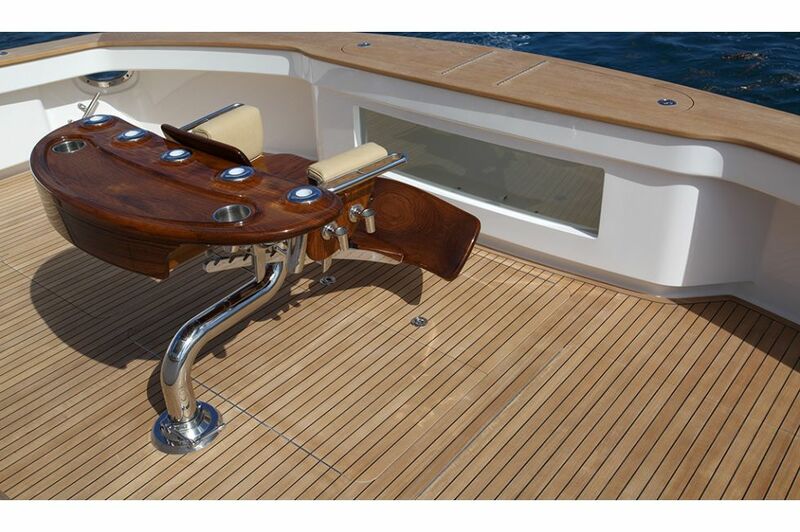 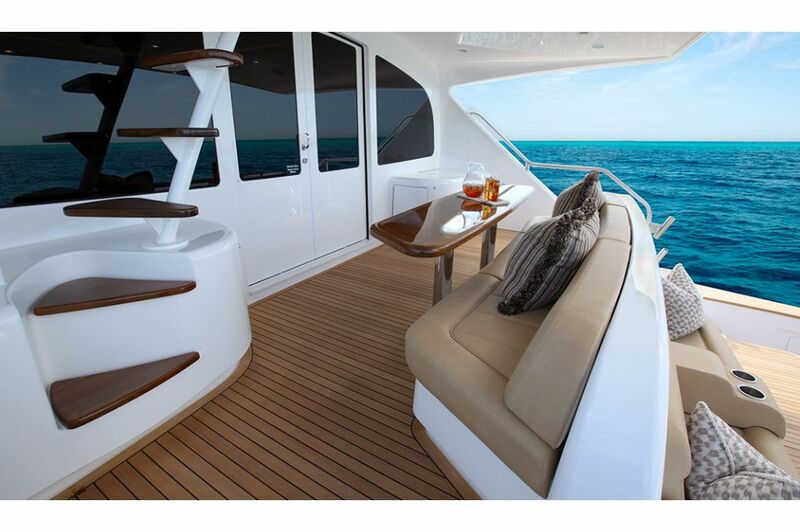 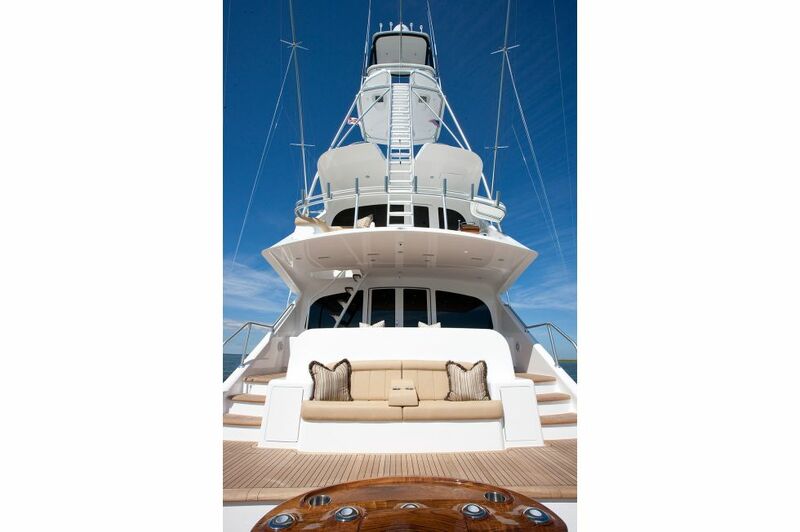 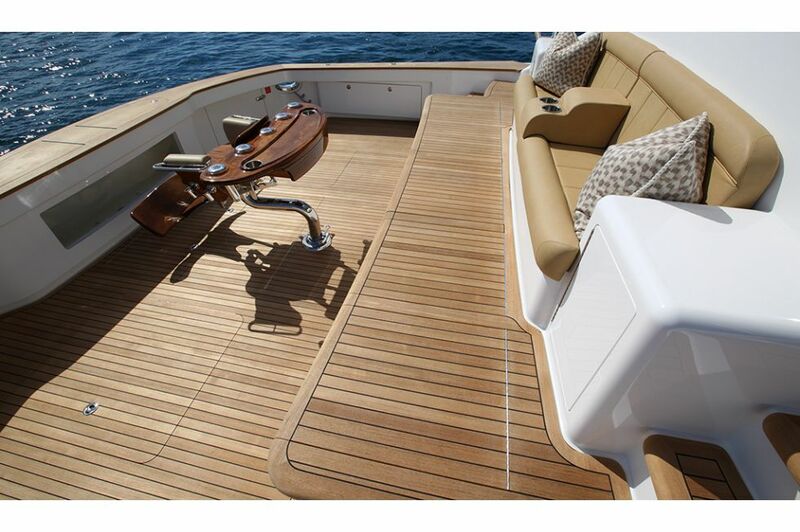 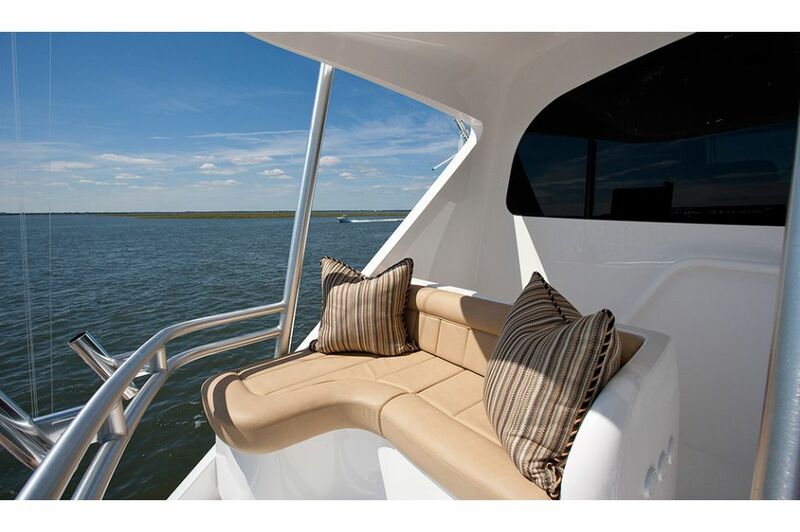 Guests can relax in a pair of finely upholstered console seats or outboard lounges (with forward-facing backrests). 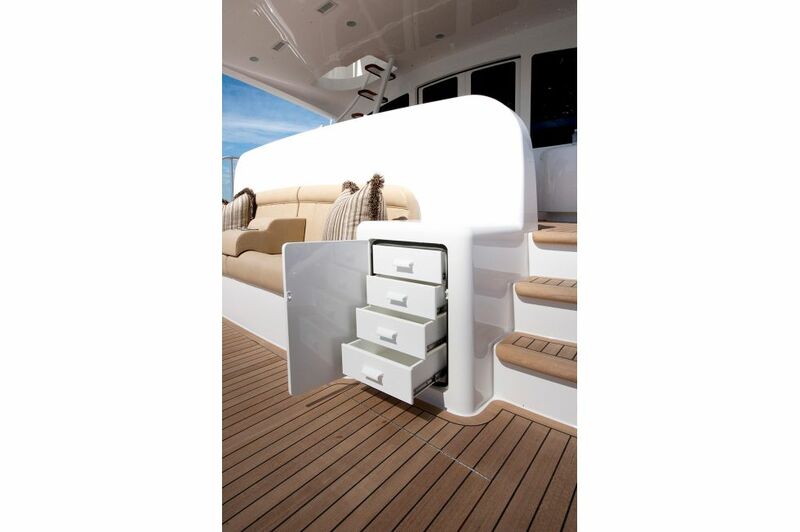 For balance and safety, toekick space is built into the console perimeter and at the lounge bases. 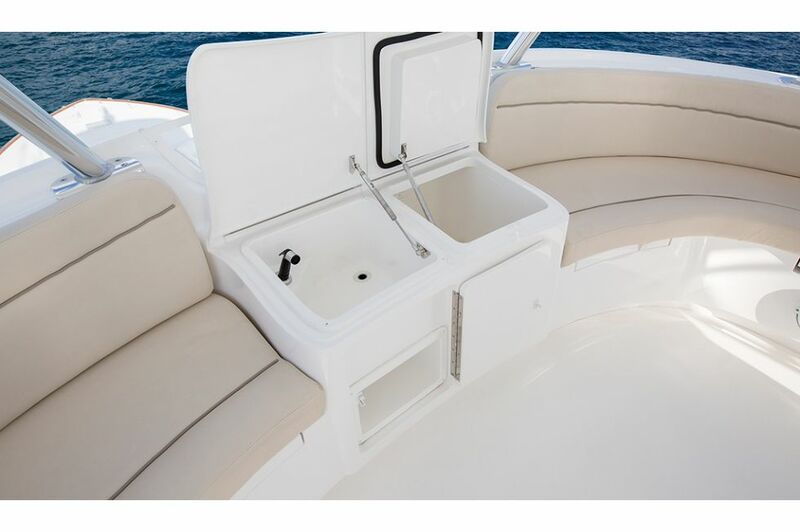 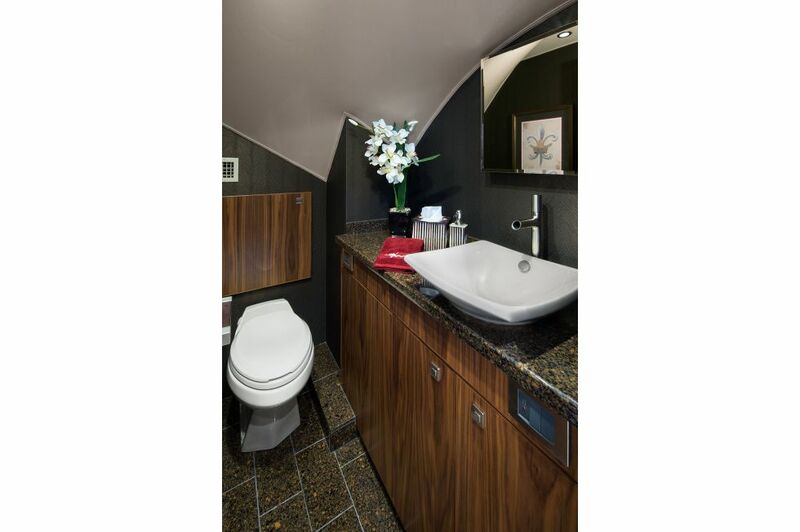 A refrigerated drink box and sink is conveniently located on centerline, between the lounges. 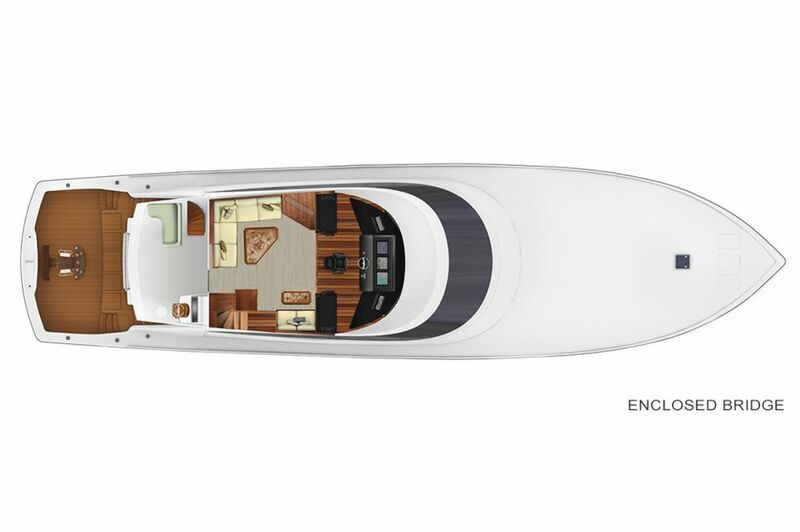 A climate-controlled retreat in itself, the enclosed bridge has a forward wrap-around console that includes a Stidd helm seat and flanking companion seating. 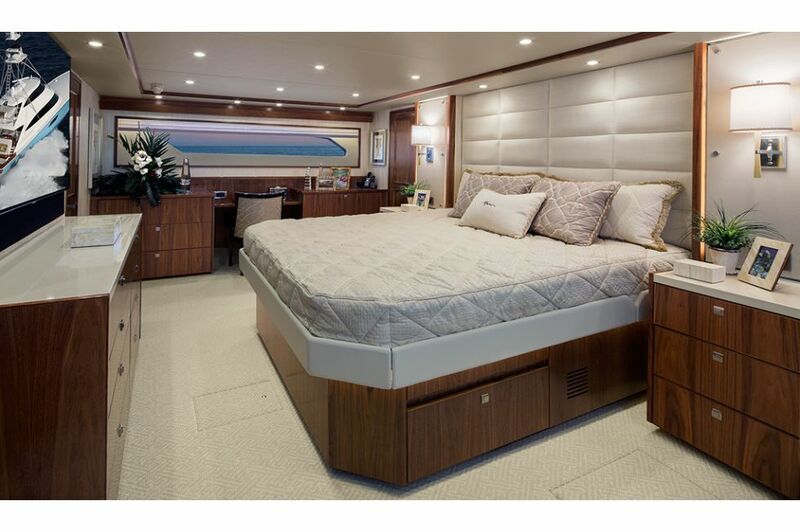 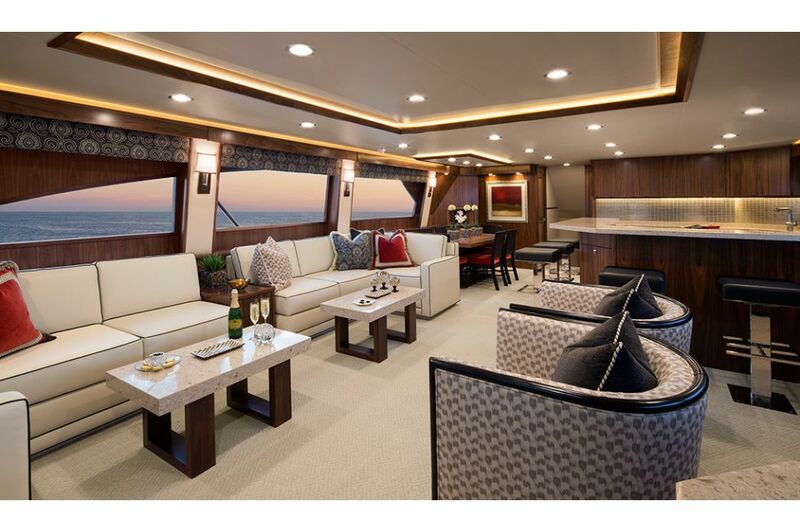 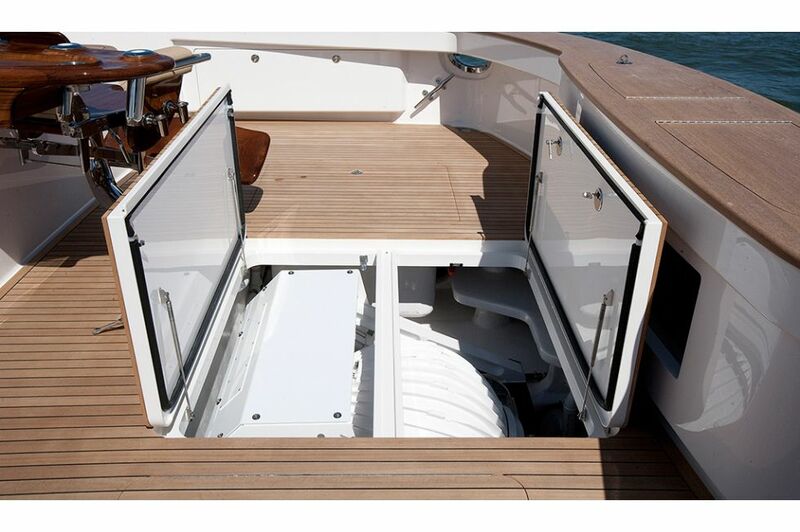 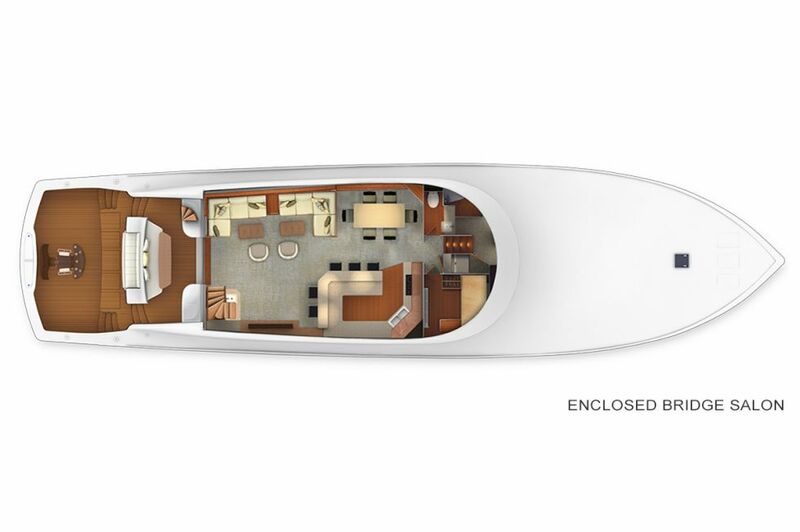 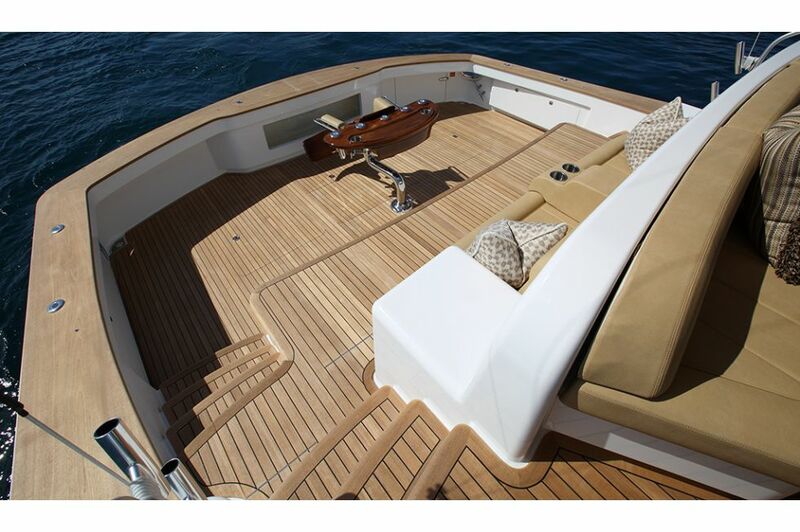 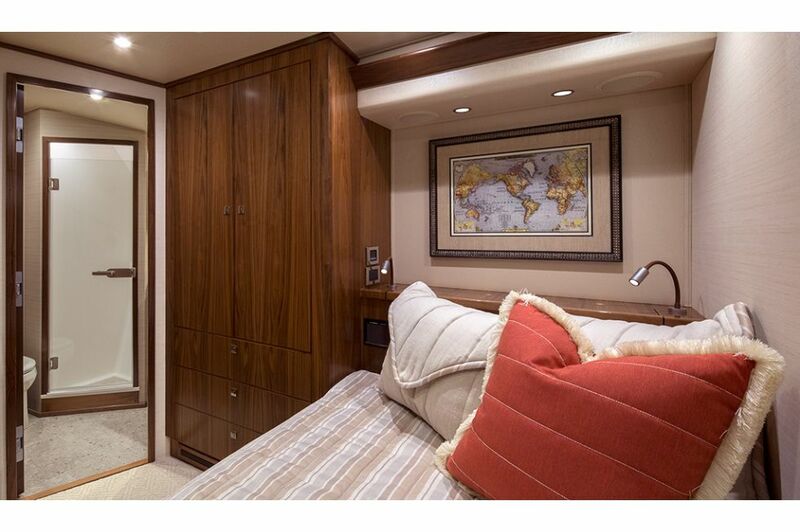 Significant room aft allows for an L-shape lounge with a walnut cocktail table to port, another seat to starboard, refrigeration and an entertainment system. 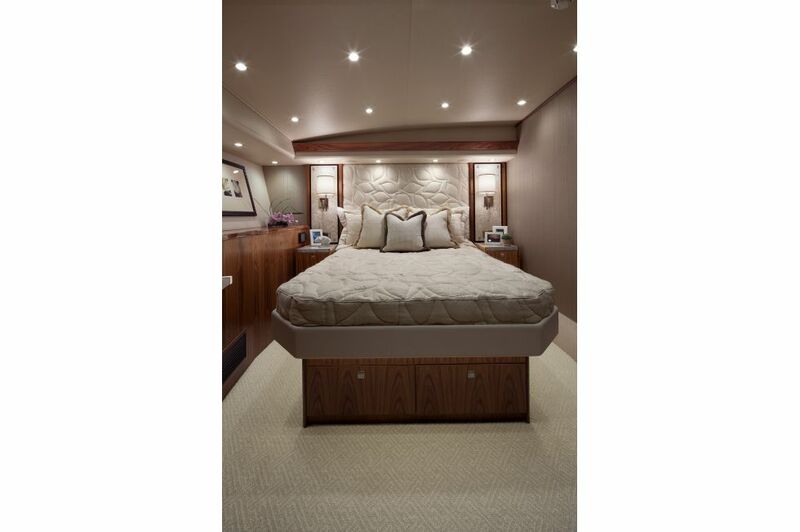 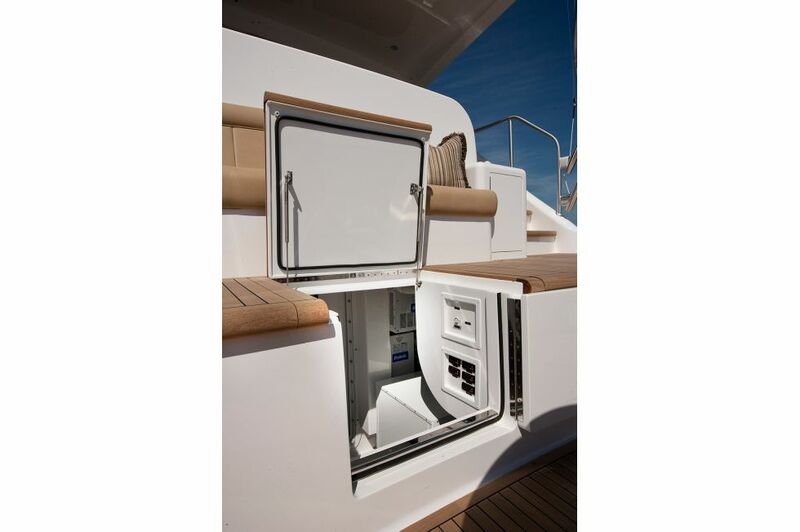 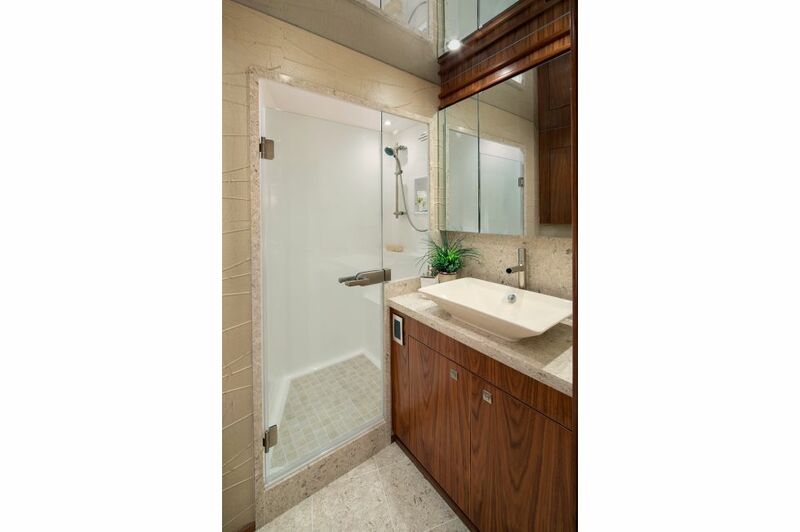 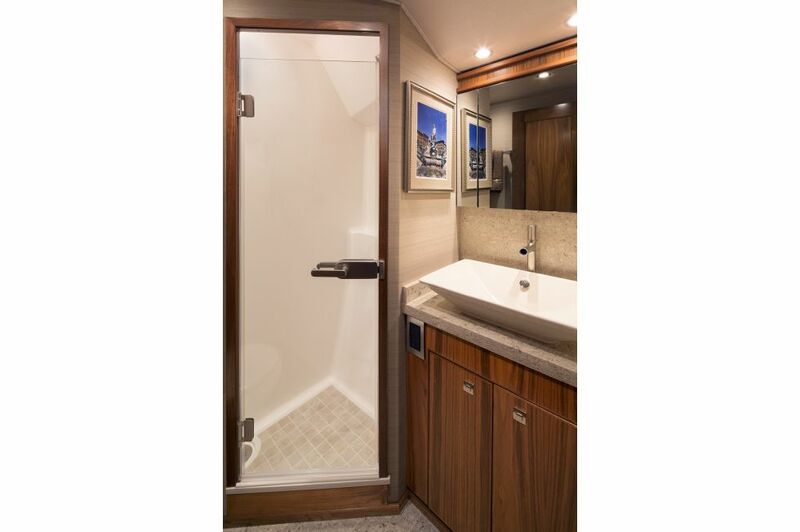 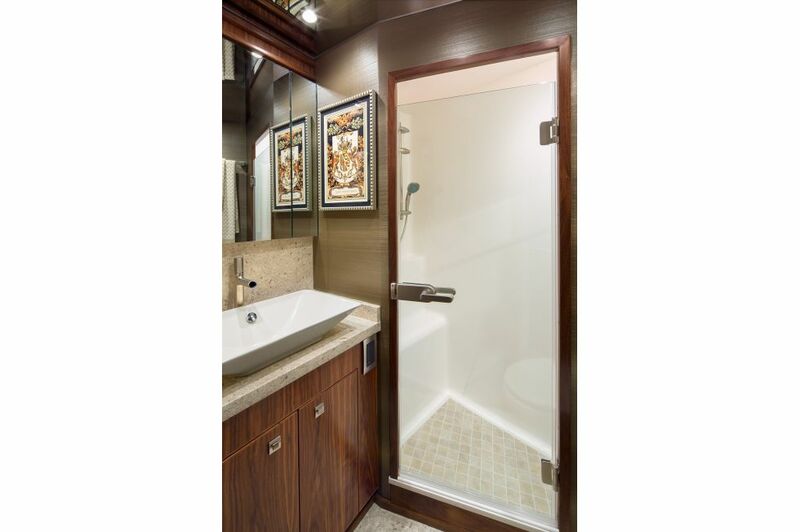 The yacht’s interior is a showpiece of elegance and luxury. 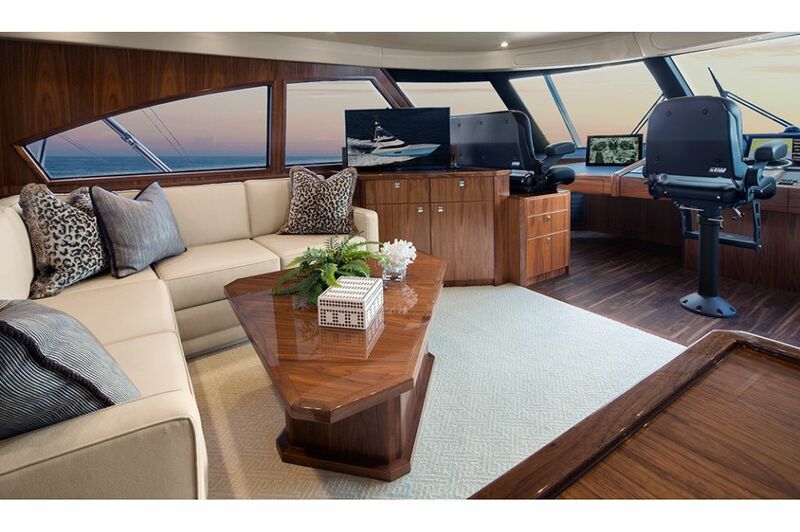 The 24-foot beam not only opens the salon but transforms it into a majestic living room with built-in furniture and plush appointments like a 65-inch flat screen television that rises on a lift out of the walnut cabinetry. 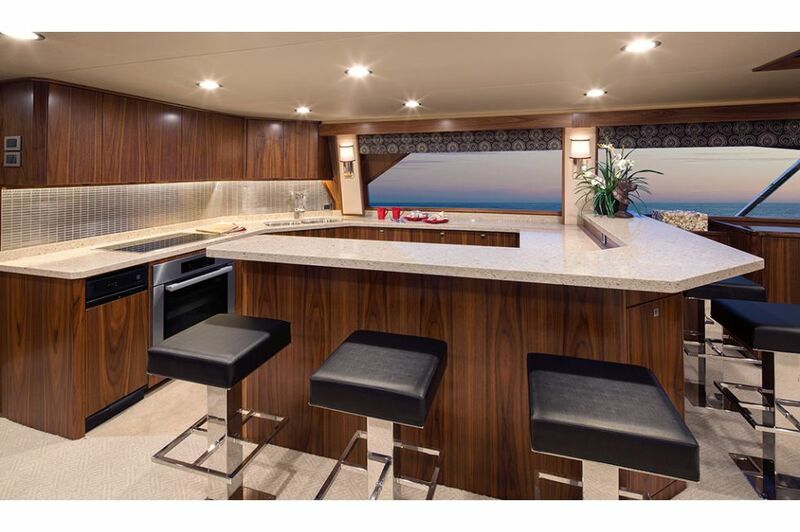 An L-shape island in the galley complements the work area and all countertops feature custom selected engineered stone. 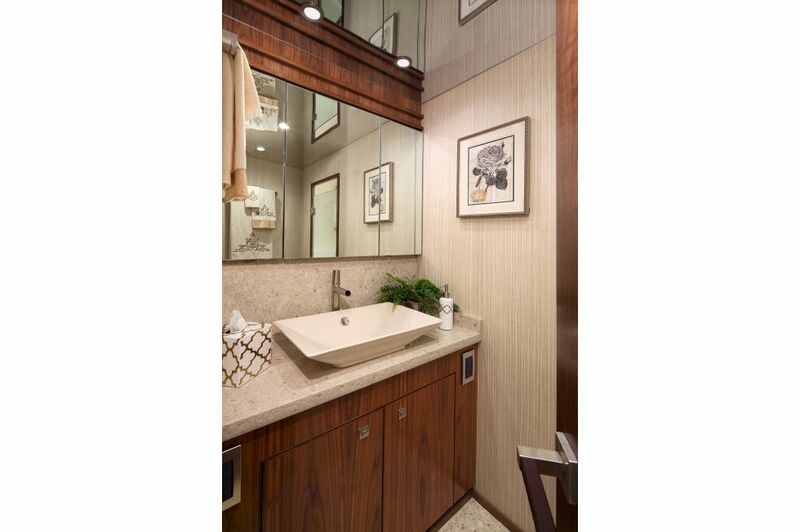 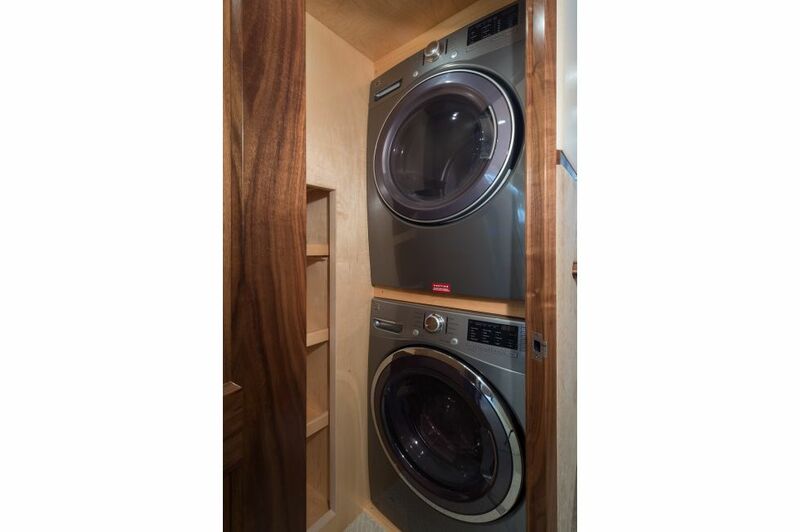 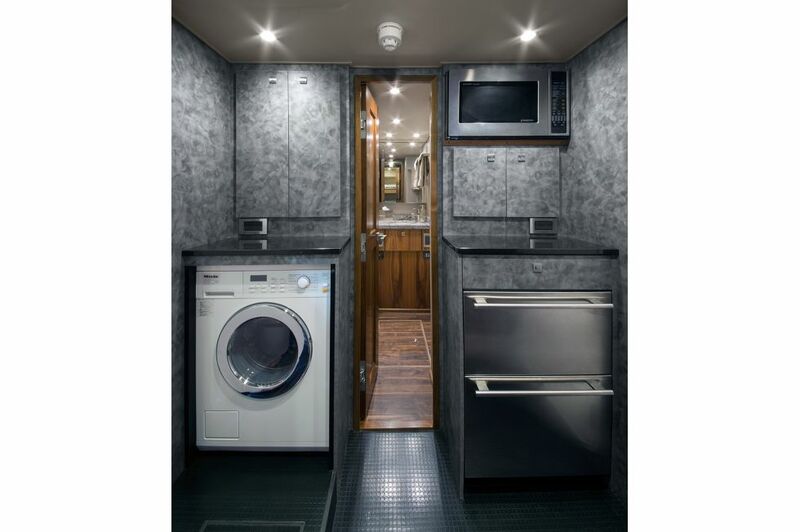 A pair of walk-in pantries and a full day head are forward and characterize an excellent use of space. 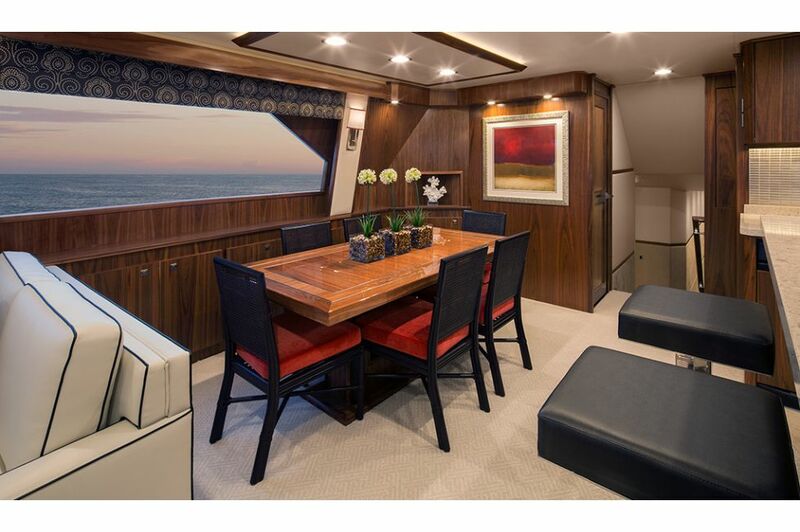 Nearby, a formal dining area accommodates eight guests. 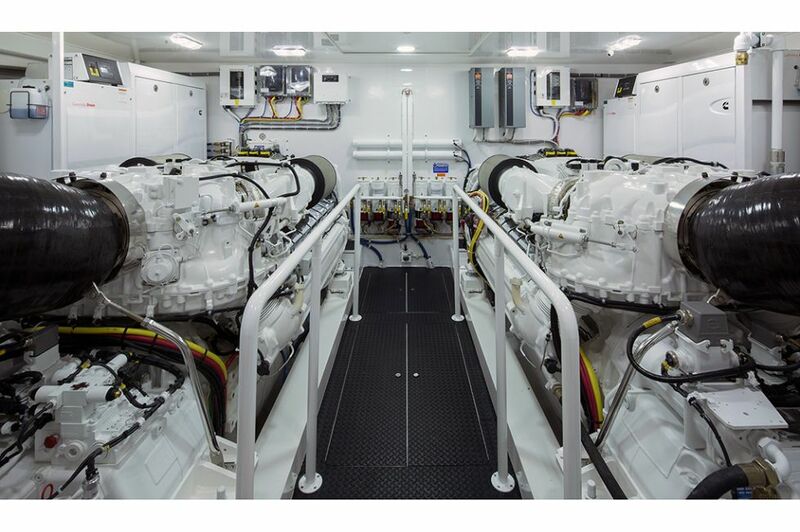 Propulsion choices include offerings by Caterpillar and MTU. 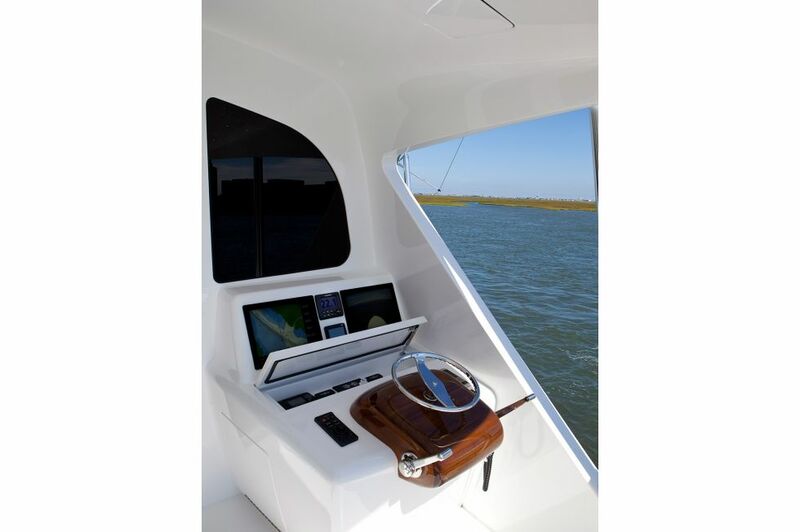 The communication, navigation and entertainment electronic package will be designed and installed by Viking sister company, Atlantic Marine Electronics. 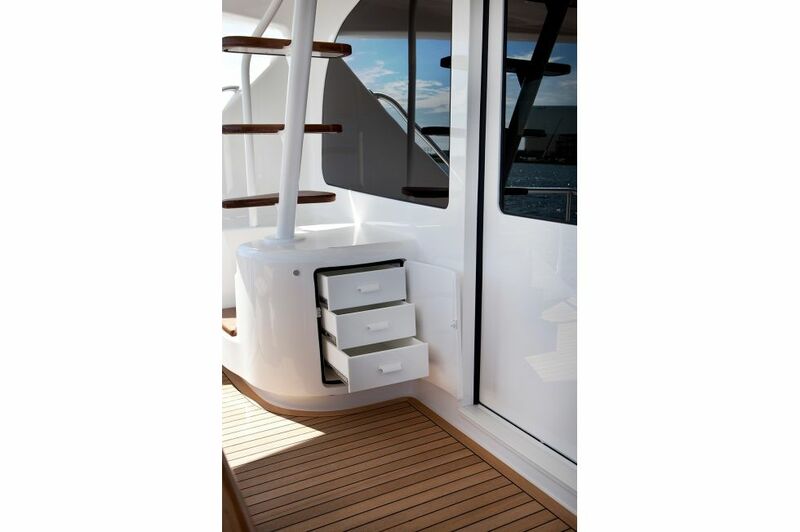 Tuna towers are designed and fabricated by Palm Beach Towers, another Viking subsidiary. 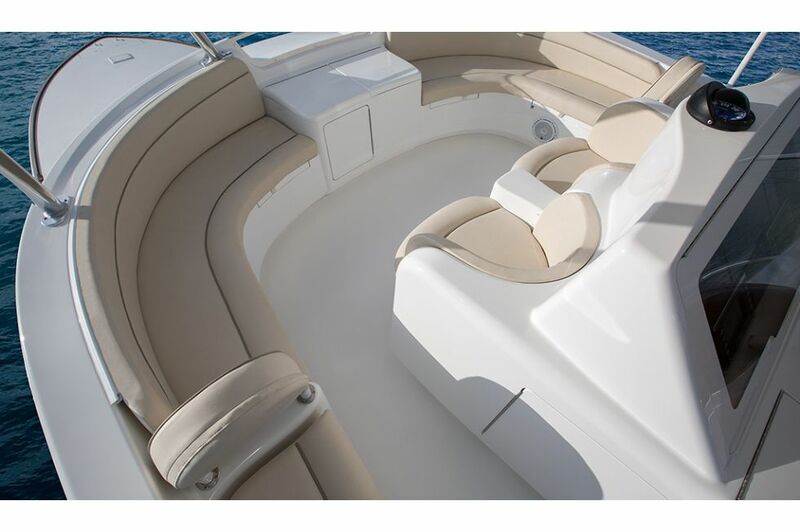 Selecting our subsidiaries for standard and optional accessories allows us to deliver the 92 Convertible turnkey ready.